Willis Reed turned the tide. 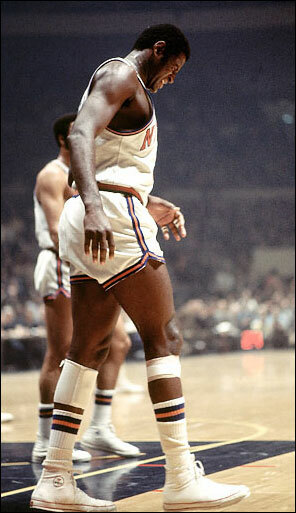 Few men loomed larger than Willis Reed. At 6’9”, Reed, the beloved yet recently beleaguered Captain of the New York Knicks, was among the tallest players in the NBA for his time. In some ways, he was larger than life. Reed’s most famous performance took place on May 8, 1970, during Game 7 of the 1970 NBA Finals against the Los Angeles Lakers in Madison Square Garden. Due to a severe thigh injury, a torn muscle that had previously kept him out of Game 6, he was considered unlikely to play in Game 7. Yet Reed surprised the fans by walking onto the court during warm-ups, prompting widespread applause. Starting the game, he scored the Knicks’ first two field goals on his first two shot attempts, his only points of the game. Walt “Clyde” Frazier went on to score 36 points with 18 assists as the Knicks won 113–99, giving New York City its first NBA title. The moment Reed walked onto the court was voted the greatest moment in the history of Madison Square Garden. The Thunder have turned the tide. Just when it looked like OKC, the Oklahoma City Thunder, were about to get swept right out of the 2014 NBA Playoffs by the San Antonio Spurs, here they come. The Thunder have tied the series at 2-2, and they’re headed back to Texas where they have to win Game 5 now or Game 7 if necessary to advance to the finals. The tide has been turned because they’ve figured out how to beat the Spurs. First, they’ve got help. The return of their big man Serge Ibaka didn’t hurt. Yes he was hurt, and yes he played hurt, but his influence has helped to hurt the Spurs in the worst way. In fact, he’s the “X” Factor. He’s the one constant in the two loses and the two wins. With Ibaka the Thunder win; without Ibaka they lose. So what is it for you? How do turn the tide when you’re back’s up against the wall? How do you turn the tide when you’re out of breath and out of money and out of time and just plain out of “luck”? What is your “X” Factor? We all know what we need to do when we don’t know what else to do. Turn to God. Turn to the presence and the power and the providence of God, and stop fighting and flaying and floundering without Him. Ibaka has turned the tide. Ibaka wasn’t supposed to play. He had an injury that they said put him out for the rest of the season. But lookie here! He’s the difference. He’s making a difference. And now his return will be looked back on as quite a difference in the play of the Thunder. While Russell Westbrook’s 40 points and Kevin Durant’s 31 in Game 4 certainly didn’t hurt, it’s been the presence and prowlness and play of Serge Ibaka, the four-year pro who rebounds and blocks shots and runs the floor and takes up space in the middle that has turned the tide. So turn the tide. How? By showing up. Your presence will make all the difference in the game and maybe in the world. Willis Reed didn’t do much in that magical game 7 at the Garden so many moons ago, but he did make a difference. Ibaka wasn’t expected to do much in this series, but he has. So make a difference. Do what you do. Don’t let the prognosis of some and the diagnosis of others weigh you down. Your presence, when positive and progressive, when cheery and chirpy, when upbeat and uplifting, could turn the tide for someone and everyone. Just give it a try.